Hayden Painting provides a high-quality, professional painting and decorating service. Their high-end painting and decorating service is available to residents of the North Dublin area. 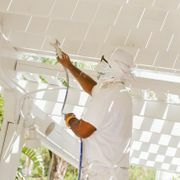 They offer a comprehensive, professional painting and decorating service, that’s complemented by their experienced team. This expert team can assist clients with paint selection, wallpaper selection and with the decorating service that's right for their property. With 30 years of experience, Hayden Painting are one of the premier painting and decorating companies in Ireland. A unique and efficient service, exclusively offered by Hayden Painting in the North Dublin area. This speedy service spray finishes the exterior of a property. In the 3 decades since Hayden Painting was established they have built up an impressive portfolio of completed works. This portfolio showcases the quality of Hayden Painting's completed projects. Boasting over 3 decades of dedicated service in the painting and decorating industry, Hayden Painting is ideally placed to offer their clients a high-end service, that's bolstered by the company’s extensive experience in all things painting and decorating. The company was founded by Joseph Hayden, who quickly established a reputation based on the professionalism and efficiency of his service. Today Hayden Painting continues this tradition of excellence, by offering their clients the very best in high-end painting and decorating. Hayden Paintingis proud to offer their clients these quality brands.